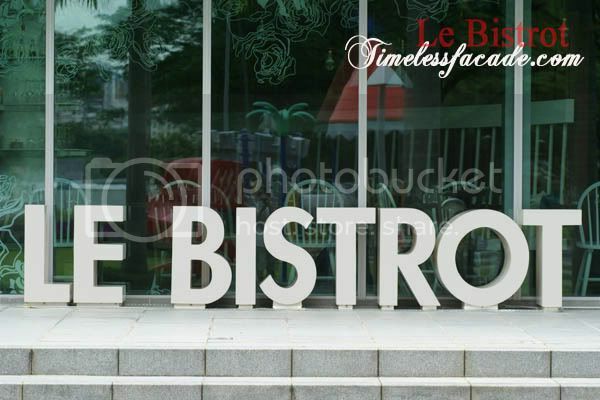 Was in the mood for a lazy and peaceful brunch late one Saturday morning so decided to skip town and head to Le Bistrot at Kallang, a bistro purportedly featuring classic and inventive French cuisine and of course a brunch menu at seemingly reasonable prices (the main draw). 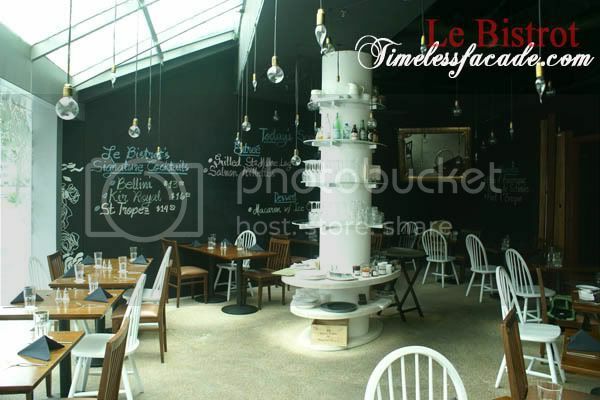 Le Bistrot boasts a rather quaint yet cozy interior with wooden paneling and cushions to go along with the co joint seats. 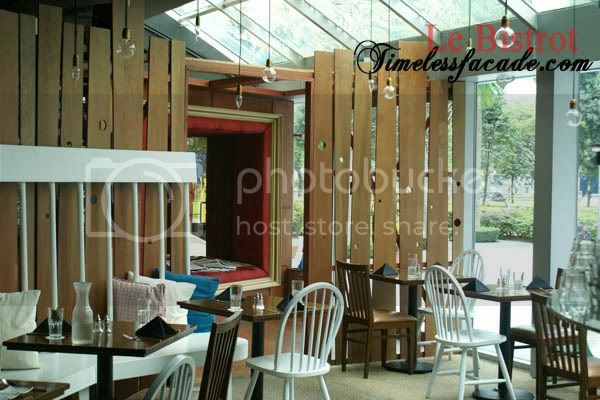 There are floor to ceiling windows and even part of the ceiling is made from glass, allowing sunlight to flow through. Very much like a homely greenhouse with bulbs hanging from the ceiling. 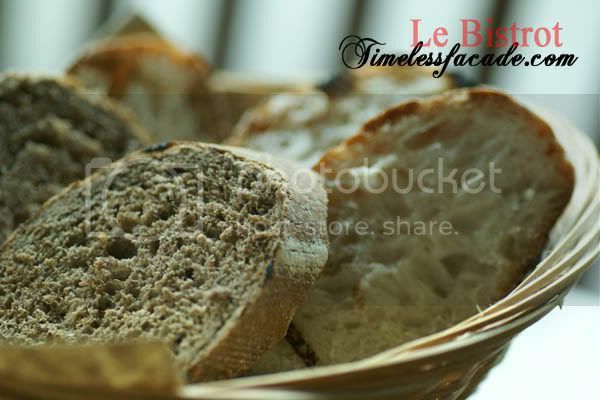 You get to choose your choice of spreads for the bread, ranging from apricot jam to chestnut jam, all self service from the wooden shelf thats sits in the centre of the room. I appreciate the choice of jams and certainly the quality of the bread, which had a muffin like texture - a tad chewy and porous. Only bone I had was that the crust was a little too hard, but at least it was served warm. Artichoke seriously isn't my cup of tea hence I didn't quite take to the salad. 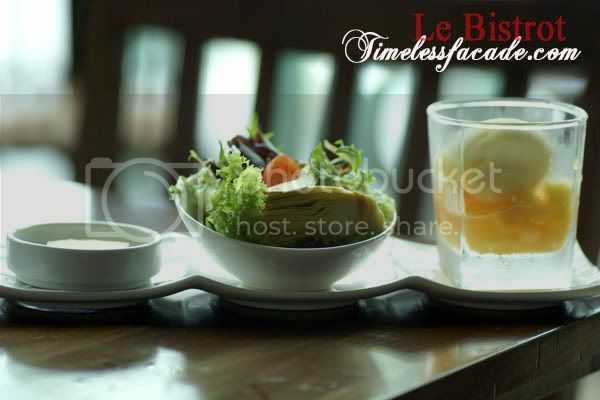 The mango sorbet was refreshing and came served with diced rock melon and pineapple cubes for added texture and taste. 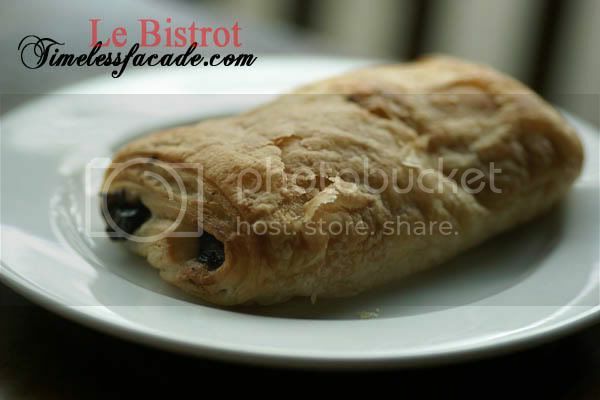 Viennoiserie, or French for Viennese Specialities, include stuff like croissants, Danish pastries etc. This particular one was a chocolate croissant I believe. Nice and flaky without the lingering oil stains on the fingers. The chocolate filling wasn't too sweet or hard, which probably meant it hadn't been lying around in the open for too long - a good sign definitely. The omelettes were a little runny yet smooth without being too heavy on the milk, which equates not nausea inducing, for me at least. The spicy pork sausage (addition of $3.50) didn't exactly wow me with its limp chilli taste and non existent smokiness. I thought better of the Nurnberger sausage(addition of $4) though, which was mildly salty with a slightly uneven texture, making it a nice accompainment to the omelette. 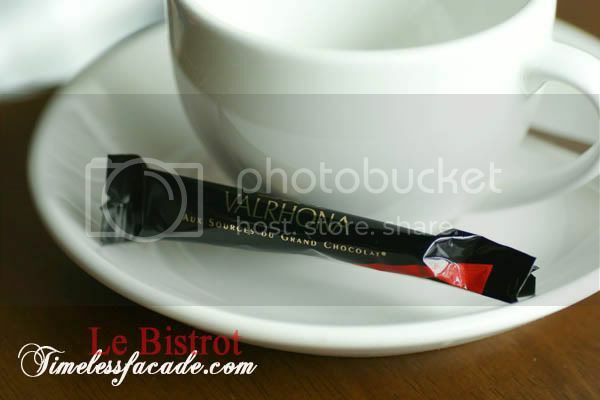 Its one of the few times I order hot chocolate in favour of coffee/tea and I must say it came as a surprise to me when we were served a small pack of valhorna 61% cocoa chocolate, a pot of heated milk and one pot of molten chocolate. 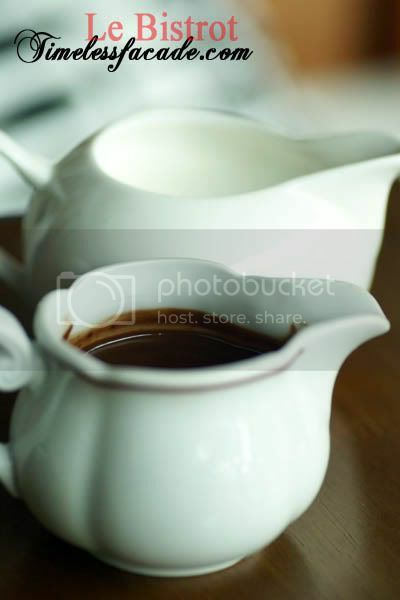 The idea is to place the piece of chocolate in your cup and pour in your desired amount of molten chocolate or milk to suit your tastebuds. Please remember to stir of course! 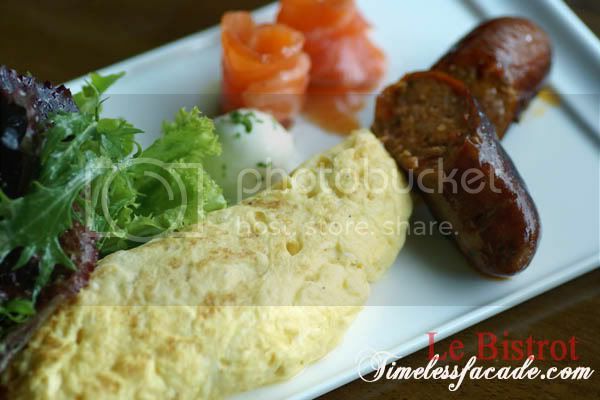 $57 for a 2 pax brunch tends towards the expensive side especially when there wasn't really much to eat. But I must admit that the environment is rather relaxing and no crowds are a big plus. Service is good as well but I doubt I'll be back for brunch, not unless they drop their prices. 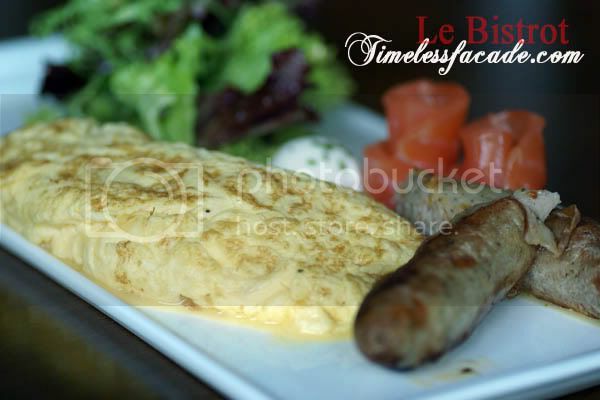 Addendum: Le Bistrot has since increased its brunch prices to $26+/pax. Your bill is dated May. Isn't that too outdated? 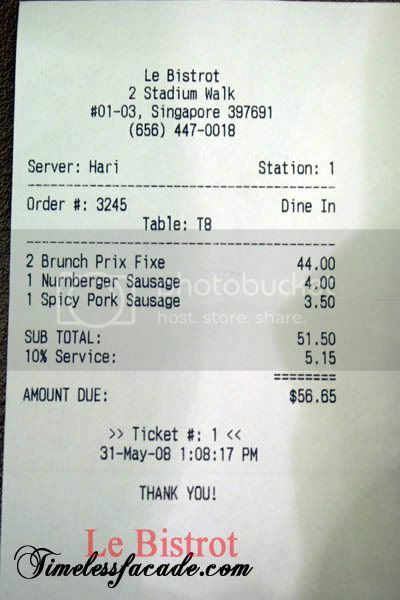 It may be misleading for readers coz prices and menu items do change. Ya the price changed but the menu is the same. I went to their website to see haha. Hi anonymous, thanks for the update!